As county administrators notified viewers about flooding and evacuation zones, the deaf and hard of hearing did not receive the same message; instead, he warned of pizza and bear monsters. 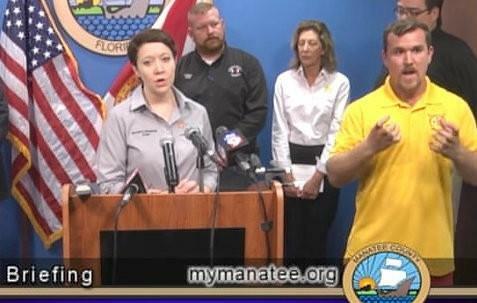 Manatee County is approaching a tentative agreement with a professional American Sign Language (ASL) company to avoid similar mistakes in the future. King Interpreting Services LLC will provide certified interpreters for televised emergency briefings. Nick Azzara is the Information Outreach Manager for Manatee County. In an email, he explained why he chose King Interpreting Services. “Of four vendors to submit proposals, I felt that King was clearly the best suited to handle on-camera press conferences with very little advanced notice, since they rely on a contractor network of individuals throughout Florida who are qualified in American Sign Language (ASL),” he wrote. In addition, several interpreters work in Manatee and Sarasota counties for the Orlando-based company, meaning they can be available on short notice. According to the Bradenton Herald, interpreters will receive between $69.50 and $119.25 an hour depending on whether it's a holiday or televised. Multiple state bills were also drafted in response to the incident. Though not passed, the legislation would have required counties to have certified ASL interpreters during televised weather emergency briefings.